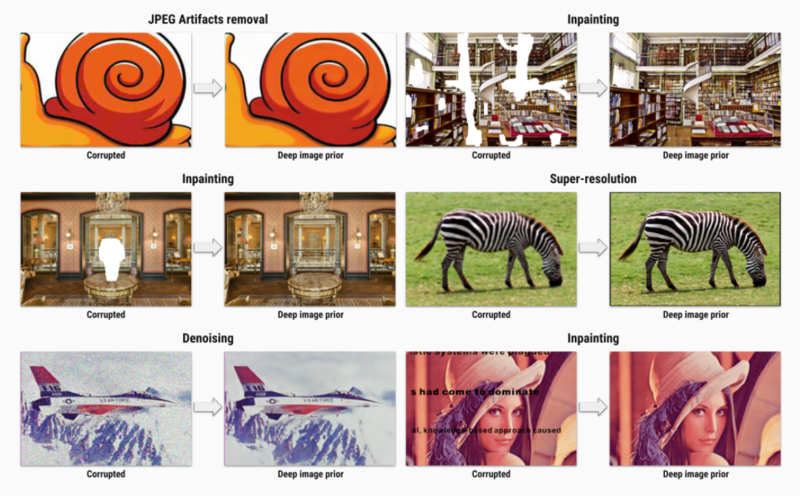 Deep Image Prior is an image enhancement and restoration system without neural network training. It uses a neural network as a prior for image processing task. The structure of the network is sufficient to capture low-level image statistics prior to any learning contrary to the common practice of training a deep neural network with a dataset. It uses randomly initialized neural network handcrafted priors to address images issues such as denoising, superresolution, inpainting and restore images based on flash-no flash input pairs. It also highlights the inductive bias captured by standard generator network architectures and bridges the gap between two very popular families of image restoration methods: learning-based methods using deep convolutional neural networks and learning-free methods based on handcrafted image priors.